Seven years ago, a very good friend was going through a tough time, and we decided we needed to lighten things up. It was one of those funny conversations that goes from nowhere to nowhere else. One thing led to another, and before we knew it, we found ourselves planning the very first “Marmot Day” on July 25, 2002. We’ve had some sort of celebration ever since on that date. Marmots are simply groundhogs, woodchucks, etc. Of course you knew that, how could anyone not know that? Well, here we are in Owosso, Michigan, home of Covenant Eyes. The nation is going through tough economic times as it is, but Michigan is perhaps the most affected state. And our county, Shiawassee County, is one of the most severely affected counties in all of Michigan. So I decided it’s time to lighten up, just like we did in 2002. 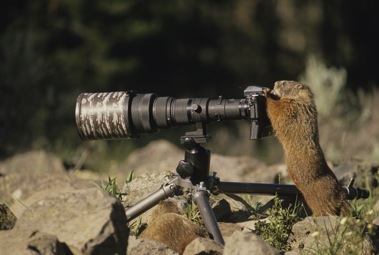 And, just like in 2002, Covenant Eyes is lightening things up with Marmot Day.We’re planning Marmot Day for Monday, July 27 (Marmot Day would logically be the Monday after July 25 if the 25th is on a weekend, right?). And if you are reading this, YOU are invited, and I hope you can come! Covenant Eyes is sponsoring Marmot Day in Owosso, and we have the support of many groups in our community. The Chamber of Commerce has included it in its calendar of events, and there are activities planned for lunchtime on Monday. There are four contests sponsored by Covenant Eyes, with prizes valued up to $1000. Anyone is welcome to enter any of the contests. The video contest will have a $1000 prize. The rules are simple: the video must be no more than 120 seconds long, must have something to do with marmots and either Covenant Eyes or internet integrity, and shall become the property of Covenant Eyes upon winning the contest. The joke contest will have a $50 prize for the best marmot joke. The rules are simple: the joke must be clean and have something to do with marmots. There is also the Bowling for Marmots contest. One lane, lane 13, at Capital Bowl in Owosso, is designated with marmot pins. There will be 4 prizes, one of $100 for the highest score, and three $50 prizes for the scores closest to 125, 160, and 200 with no frames with two gutter balls. Then there is the Putting for Marmots Tournament. Capital Bowl has an indoor putting course, and on July 6 there will be a tournament with prizes for the winners and for all participants. So why are we doing this? Fun is the bottom line. We want to give something to our community that is fun, and maybe even help awareness of how nice a community Owosso is. We want to do something fun for our employees and hopefully fun for the attendees as well. Funny thing is, the Alaska State legislature picked up on Marmot Day, and they actually voted to make February 2 the Alaska Marmot Day, and they even referenced the Owosso Marmot Day. Please come! Lunch is on us, be here at 11 AM on Monday, July 27… and don’t forget to enter a video and your best marmot joke!